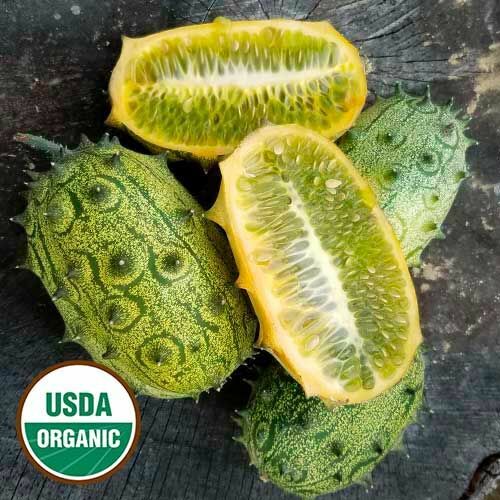 (Cucumis metuliferus) Also known as Kiwano or African horned cucumber, though botanically, this thorny oval fruit, filled with lots of seed and greenish-gold gel, is not a cucumber. The flavor is reminiscent of pomegranate and citrus and high in Vitamin C. Jelly Melon originated in semi-arid Africa near the Kalahari Desert and is often used as a garnish or decorative fruit. 120 days.